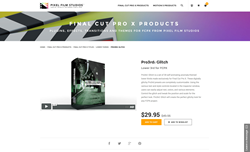 Pixel Film Studios, developer of visual effect tools for post-production, announced the availability of Pro3rd Glitch, allowing film editors to add digitally glitchy lower thirds for FCPX projects. 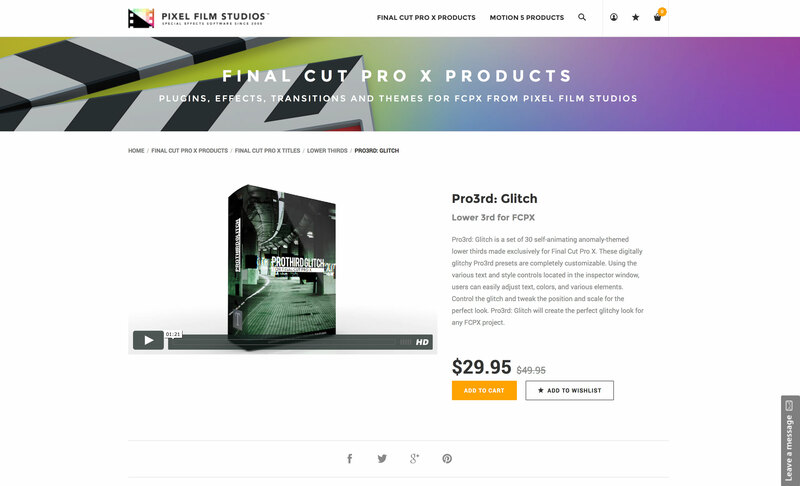 With the release of Pro3rd Glitch, the Production Team at Pixel Film Studios aimed to create a widely applicable set of glitchy themed titles for the FCPX community. "With the release of Pro3rd Glitch, the Production Team at Pixel Film Studios aimed to create a widely applicable set of glitchy themed titles for the FCPX community," said an official spokesperson for the company. Pro3rd Glitch has a set of 30 self-animating anomaly-themed lower thirds made exclusively for Final Cut Pro X. These digitally glitchy Pro3rd presets are completely customizable. Using the various text and style controls located in the inspector window, users can easily adjust text, colors, and various elements. Control the glitch and tweak the position and scale for the perfect look. Pro3rd Glitch will create the perfect glitchy look for any FCPX project. Add a glitchy style to any digital production with Pro3rd Glitch. Pick from twitchy and glitchy presets with customizable style controls to create a digital display with fun anomalies. Each preset is self-animating and simple to use. Just drag, drop, and stylize. Each preset can be edited with easy to use on-screen controls. On screen controls make it easy for users to control rotation, scale, and position of the various elements in each preset. Using the various parameters found in the top right inspector window, users can easily lengthen Pro3rd presets and stylize title elements with color wheels and slider controls. Utilizing Pro3rd Glitch is as easy as cheat codes on video games. With the ability to drag and drop, scroll over any of the Pro3rd presets to preview the animations in the viewer window. Then, simply take any preset and drag it over the selected media in the timeline window. On screen controls make it simple to place and stylize the text. Pro3rd Glitch is completely customizable in Final Cut Pro X. Checkboxes, color wheels, and sliders make it extremely easy for users to edit presets. Users can easily manipulate and tweak the look, feel, and length of any of the presets. Pixel Film Studios makes editing completely easy in FCPX.